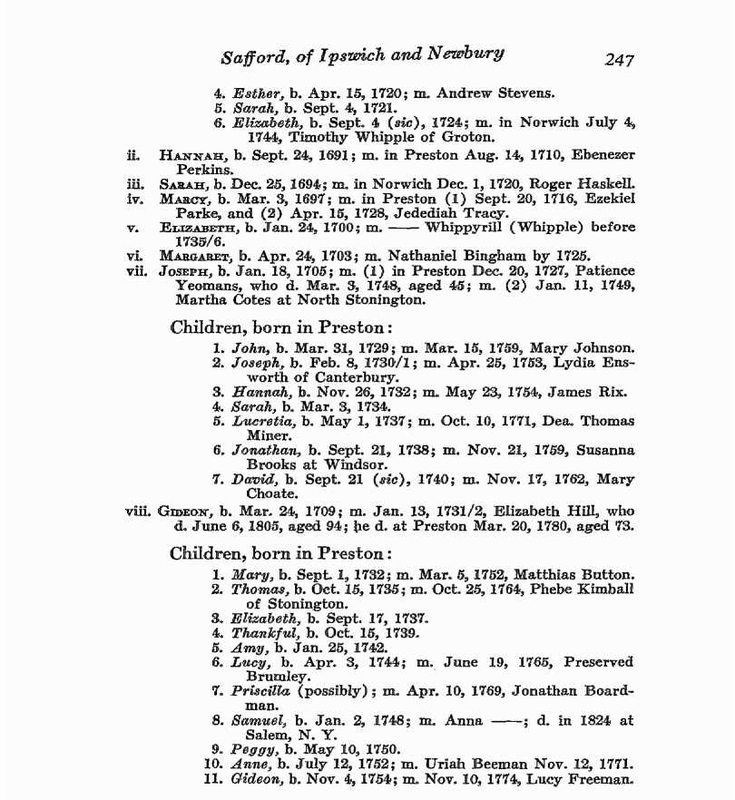 John SAFFORD Jr. (1662 -1736) was Alex’s 9th Grandfather; one of 1,024 in this generation of the Shaw line. John Safford Jr. was born in 1662 at Ipswich, Essex County, Massachusetts, England. His parents were John STAFFORD Sr. and Sarah LOW(E). He married Hannah NEWMAN 15 Sep 1685 in Ipswich, Mass. Many researchers say after Hannah died, John married Abigail Martin on 28 Jun 1702. However, it was John’s first cousin with the same name John Safford who married Abigail Martin. (See the discussion below) Our John was married to a Deborah when he died, as evidenced by naming her in his will, but she is not buried in the Preston Cemetery. John died on 29 Mar 1736 at Preston, Connecticut. There has been a lot of confusion about whether John’s mother Sarah Lowe was married to Joseph Safford or John Safford. All Low family genealogy research says she was married to Joseph, but Safford research says Joseph was married to Mary Baker. Hannah Newman was born on 16 Feb 1666 at Ipswich, Essex County, Massachusetts. Her parents were Thomas NEWMAN Jr. and Hannah MORSE. 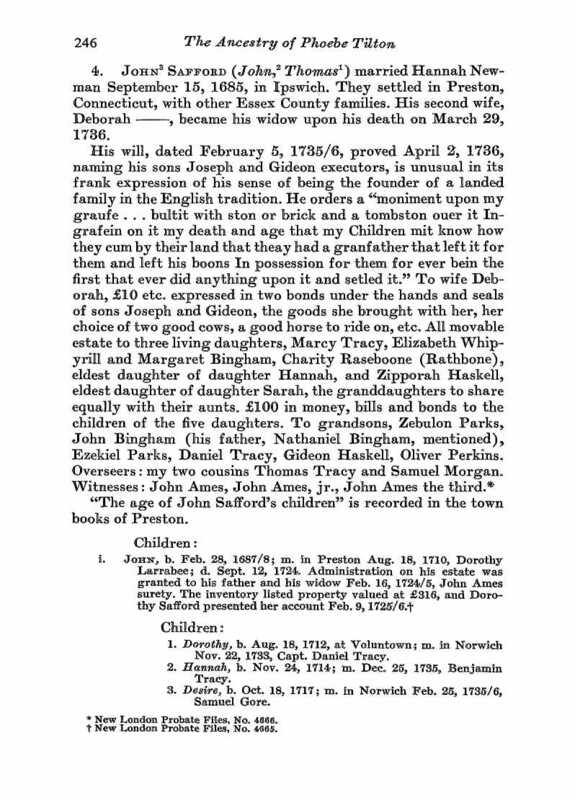 If Hannah really died in 1702 in Preston, CT. like most genealogies say, then Dorothy [__?__] is probably the mother of Margaret, Joseph and Gideon. However, I can’t find any evidence of Hannah’s date of death or Dorothy’s marriage. Abigail Martin was born in 1675 in Ipswich, Essex, Mass. Her parents were Samuel Martin and Abigail Norton. 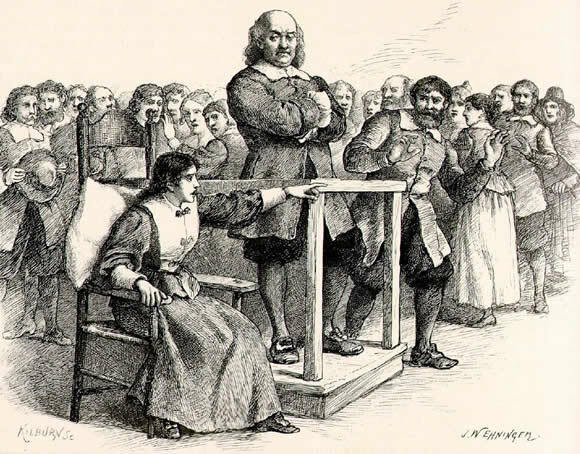 Abigail died in 20 Mar 1768 in Norwich, CT.
We are not descended after all to the Abigail Martin that testified that she was afflicted by 13 different people in the Salem Witch Trials when she was a teenager. 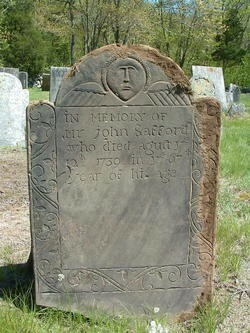 John’s first cousin John Safford married Abigail in 1702, 10 years after the witch trials were over. 5. Elizabeth Safford 24 Jan 1700 James Braman? John was administrator of the estate of his father-in-law, Thomas Newman, March 5, 1691. He resided at Ipswich; d. 1780. John and Hannah settled in Preston, Connecticut with other Essex County families. In 1686, Thomas Parke, Thomas Tracy, and several others petitioned for and were granted by the Connecticut General Court authority to establish a plantation seven miles square to the east of Norwich and north of New London and Stonington. Owaneco, son of the Mohegan sachem Uncas, gave a confirmatory deed for the land in 1687. In October of that same year, the town was formally incorporated as Preston. John’s daughter Mary later married a Parke and then married a Tracy. The first settler of Voluntown, Connecticut was Samuel Fish, soon followed by John Gallup, John and Francis Smith, Robert Parke, Thomas Reynolds, Thomas Coles, John Campbell, John SAFFORD Jr, Obadiah Rhodes and Samuel Whaley. Most of the land which makes up the present town of Voluntown was granted in 1700 by the Court to the Volunteers of the Narragansett War in 1700, thus the name “Voluntown.” Preston is 10 miles from Voluntown was maybe John Safford’s homestead was halfway between the two modern villages. In 1705 the town was surveyed and boundaries were established. The plot was drawn up into lots, with each eligible volunteer receiving a lot. The land was rough terrain, although fertile soil, and was in a remote location. According to a portion of the will provided by another Safford researcher John’s son Joseph and Gideon were executors. He leaves to his wife Deborah all movable estate. To three living daughters, Mary Tracy, Elizabeth Whipyrill and Margaret Bingham. Charity Perkins Rathbone, eldest daughter of daughter Hannah, and Zipporah Haskell, eldest daughter of daughter Sarah, the granddaughter to share equally with their aunts. To wife Deborah £10 etc. expressed in two bonds under the hands and seals of sons Joseph and Gideon, the goods she brought with her, her choice of two good cows, a good horse to ride on, etc. All movable estate to three living daughters Marcy Tracy, Elizabeth Whipyrill and Margaret Bingham, Charity Rasebonne [Rathbone] eldest daughter of daughter Hannah, and Zipporah Haskell, eldest daughter of daughter Sarah, the granddaughters to share equally with their aunts £100 in money, bills and bonds to children of the five daughters. To grandsons, Zebulon Parks, John Bingham, Ezekiel Parks, Daniel Tracy, Gideon Haskell, Oliver PERKINS. No mention is here made of son John, born 1687. No mention is made of him as being buried in the Safford Cemetery, either. Marcy is probably daughter Mary, b 1697, Elizabeth, b 1700, Margaret, b 1703. Daughter Hannah had evidently died by this time as evidenced by the will, same with Sarah, b 1694. With Gideon and Joseph as executors, that makes 7 listed. Only John is not listed. The John that married Abigail Martin moved to Norwich Ct., fairly close to Preston. He is buried in the Ames Cemetery in Lisbon, Ct. He died 12 Aug 1739, age 66, thus born circa 1673. The tombstones of both Abigail and John are still existing in the Ames Cemetery. Information about the Safford family is confusing and conflicted. It’s difficult to say for sure just who was married to whom. There were two first cousin John Saffords, both from Ipswich, Mass and they both moved to Connecticut. One John was born in 1663, the other in 1673. The John that married Hannah Newman was the son of Joseph. They moved to Preston, New London, Ct. He died there March 29, 1736 at age 73, thus was born in 1663. He is buried in the Safford Cemetery. He evidently married twice, the second time to a Deborah, as evidenced by a will he wrote naming her. John’s cousin that married Abigail Martin moved to Norwich Ct., fairly close to Preston. He is buried in the Ames Cemetery in Lisbon, Ct. He died 12 Aug 1739, age 66, thus born circa 1673. As to John having 2 or 3 wives, Abigail being second or third, notice THIS. She was born circa 1676. She is buried next to the John at the Ames Cemetery. She died age 92, on 20 March 1768. The two other Johns died in 1736 and 1739. She outlived both of them by many years. John’s wife Dorothy Larrabee was born 25 Mar 1686 in Norwich, New London, Connecticut. Her parents were Greenfield Larrabee and Alice Parke. 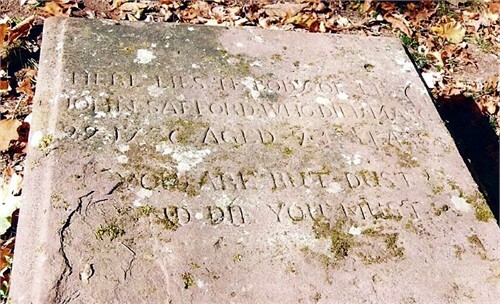 Dorothy died in 1723 in Connecticut. Elizabeth might have married a James Braman of North Kingstown, RI who purchased property in Voluntown, New London, CT in 1729. He and wife Elizabeth had seven children between 1730 and 1740; he died by Nov. 1739 when his probate was started. Elizabeth’s second husband Timothy Whipple (Whipyrill) was born 28 OCT 1723 in Groton, New London, Connecticut. His parents were Samuel Whipple and Ruth Card. Timothy died 04 Nov 1796 in Brattleboro, Windham, Vermont. The first property James Braman purchased in Voluntown was from Ebenezer PERKINS. Ebenezer Perkins married Hannah SAFFORD, an older sister of Elizabeth Safford, another clue Elizabeth may have married James Braman. Margaret’s husband Nathaniel Bingham was born 30 Jun 1704 in Norwich, New London, Connecticut. His parents were Thomas Bingham and Hannah Backus. Nathaniel died 1756 in Mansfield, Tolland, Connecticut. Joseph’s first wife Patience Yeomans was born 26 Jan 1702 Preston City, New London, CT. Her parents were Samuel Yeomans and Mary Ellis. Patience died 8 Mar 1748. Gideon’s wife Elizabeth Hull (Hill?) was born 5 Feb 1715 in Stonington, New London, Connecticut. Her parents were John Hill and Elizabeth Yarrington. Elizabethe died 6 Jun 1805 in Preston, Connecticut. Gideon’s son Thomas b. 1738 was a soldier in the French and Indian war and was in Captain Jonathan Brown’s company at Lake George in 1758. During the revolution he was living at or near Watertown, and he enlisted July 2, 1778, with others to serve as guards over the powder magazine for six months. He continued to serve on this duty until August 2, 1779. He was called “corporal” in some of the records. He married at Watertown, July 31, 1764, Sarah Kettell, of Medford, his residence being given as Dedham. His wife joined the Dedham church, March 23, 1766. The only record of birth of children born to Thomas and Sarah is found in Dedham records: Thomas, baptized at Dedham, August 24, 1766, by Rev. Mr. Townsend. This entry was posted in 11th Generation, Line - Shaw, Pioneer, Witch Trials and tagged Voluntown Pioneer. Bookmark the permalink. 11 Responses to John Safford Jr.